Flow cytometric analysis of jurkat cells, untreated (green) or treated with LY294002 #9901 (50uM, 2hr), Wortmannin #9951 (1uM, 2hr), and U0126 #9903 (10uM, 2hr) (blue), using Phospho-4E-BP1 (Thr37/46) (236B4) Rabbit mAb (Alexa Fluor® 647 Conjugate) (solid lines) or concentration-matched Rabbit (DA1E) mAb IgG XP® Isotype Control (Alexa Fluor® 647 Conjugate) #2985 (dashed lines). 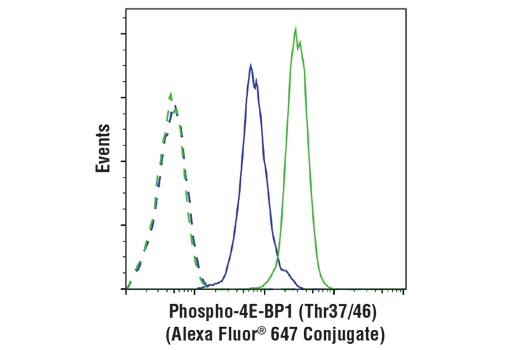 Phospho-4E-BP1 (Thr37/46) (236B4) Rabbit mAb (Alexa Fluor® 647 Conjugate) detects endogenous levels of 4E-BP1 only when phosphorylated at Thr37 and/or Thr46. This antibody may cross-react with 4E-BP2 and 4E-BP3 when phosphorylated at equivalent sites. Monoclonal antibody is produced by immunizing animals with a synthetic phosphopeptide corresponding to residues surrounding Thr37 and Thr46 of mouse 4E-BP1. The antibody was conjugated to Alexa Fluor® 647 under optimal conditions with an F/P ratio of 2-5. The Alexa Fluor® 647 dye is maximally excited by red light (e.g. 633 nm He-Ne laser). Antibody conjugates of the Alexa Fluor® 647 dye produce bright far-red-fluorescence emission with a peak at 665 nm. This Cell Signaling Technology (CST) antibody is conjugated to Alexa Fluor® 647 fluorescent dye and tested in-house for direct flow cytometric analysis of human cells. The unconjugated antibody, Phospho-4E-BP1 (Thr37/46) (236B4) Rabbit mAb #2855, reacts with Phospho-4E-BP1 (Thr37/46) from human, mouse, rat and monkey. CST expects that phospho-4E-BP1 (Thr37/46) (236B4) Rabbit mAb (Alexa Fluor® 647 Conjugate) will also recognize Phospho-4E-BP1 in these species.